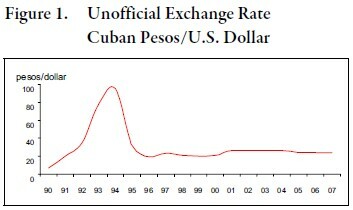 In 2004, the Cuban Government announced the prohibition of the use of the U.S. dollar as a means of exchange in retail as well as in other commercial operations. From then on, all transactions have been conducted using Cuban convertible pesos (CUC), the Cuban peso backed in U.S. dollars. Cuban authorities proclaimed that the proscription of the U.S. dollar was an act of independence, aimed at untying the Cuban economy from the currency of the staunchest enemy of the Revolution. This measure was presented as a decisive move towards monetary convergence, a step to end the nation’s dual monetary system, which also features several exchange rates. Embracing the use of the U.S. dollar has been a thorny issue for the Cuban leadership. In fact, since the very creation of the Cuban Central Bank in 1997, the authorities stressed the need for a single currency.1 We have often heard Cuban officials criticizing the use of the dollar. But time has passed and nothing—even the plunge of the dollar against other foreign currencies— has managed to uproot the American currency in Cuba. It is noteworthy that by dollarization we mean more than the use of the U.S. currency. In the economic literature, dollarization means total or partial replacement of the national currency by a foreign currency, with regard to the three functions of money: means of exchange, unit of account, and store of value. Hence, we believe that the opinions and conclusions presented in this paper are valid in the event another foreign currency—the Euro, for example—should displace the U.S. dollar as the prevailing foreign currency in Cuba. The CUC has also failed to foster monetary convergence. Moreover, criticism of the dual system has gained more proponents and spread across the country. Whether ordinary citizens, dissidents, or Cuban officials, they all agree that the current dual monetary system should be eliminated. For some, the CUC embodies a discriminatory action against Cuban workers, who are paid in authentic Cuban pesos (ACP). For others, the coexistence of the CUC and the ACP creates a distortion that prevents the economy from an efficient allocation of resources. The monetary issue has become so important, that General Raúl Castro could not avoid the issue in his first speech as the new head of the Cuban Government. In this paper, we review the performance of the Cuban monetary system over the past four years. We also examine some likely scenarios for the Cuban economy and monetary system, based on the latest political developments in Cuba, and the recent takeover by a new head of state. This paper is also based on my personal experiences during my last visit to Cuba in 2006. We conclude that the CUC should be eliminated, no matter the final path of Cuba’s transition. In 2003, the Cuban Government began to roll back the tepid reforms started in 1993. The counter-reform marked the return to centralization and the elimination of some concessions to public firms and the incipient private sector. In July 2003, the Cuban Government made the first big move against the circulation of the dollar in Cuba. From this point forward, all transactions in the dollarized network would have to be conducted in CUC. Deposits and banking accounts of Cuban firms also would have to be denominated in CUC. In addition, all operations by Cuban firms demanding foreign currencies would require approval of the Cuban Central Bank. A radical move followed the next year. A decree passed in November 2004 designated the CUC as the only currency accepted in the dollarized network of goods and services. At the same time, the Government established a 10% tax on the U.S. dollar. By taxing the U.S. dollar, the Cuban Government was supposedly encouraging remittances in other foreign currencies. U.S. restrictions on the use of U.S. dollars by Cuba were allegedly the reason for implementing the tax. Cuban economists claim that this measure has succeeded in slashing the share of inflows in dollars from 80% to 30%.2 Finally, the CUC was officially appreciated against all foreign currencies in April 2005. The offensive against decentralization, the private sector, and the U.S. dollar was not a coincidence. External factors have played a key role in the strengthening the CUC. Very favorable trade terms and other inflows from Venezuela have made possible the return to centralization. The Cuban Government has reasons to ooze confidence. Thanks to Venezuela, Cuba is now shielded from the ravages of the oil market.3 Revenues from services rendered by Cuban workers in Venezuela have enabled the island to double imports over three years, 2003–2006. Chinese investments in nickel have also helped, but they pale compared to the paramount support from Venezuela. The special relationship with Venezuela has given the Cuban Government enough power and confidence to behave the way it really wants to. Meanwhile, the Government has overturned some measures it grudgingly accepted in the 1990s. Many small foreign firms have been expelled and self-employment licenses trimmed. Moreover, the high degree of confidence on inflows from Venezuela has put the Government in the “comfortable” position of being able to focus just on those strategic sectors, like nickel and energy, considered as less costly from the political standpoint. Other sectors, like tourism and agriculture, seen as potentially dangerous within the political equation, have been neglected. The economic stability has secured exchange rate stability. In spite of some ups and downs, the Cuban peso has been hovering around 24 pesos per U.S. dollar (Figure 1). Since 1994, the Government has not faced a sudden and sharp devaluation of the Cuban peso. This rate is no exempted of Government manipulation. After the elimination of the U.S. dollar as a means of payment, most exchange outlets sell Cuban pesos and CUC. However, buying back U.S. dollars or any other foreign currency can be done at few places. The CUC has not helped tourism at all. I have not conducted empirical research to measure the impact of the CUC appreciation on foreign tourism in Cuba. Nevertheless, tourists are doubtlessly feeling the heat. Based on my experiences during my last visit to Cuba in 2006, I perceived that tourist money does not go very far, and visitors experience how their funds literally evaporate as a result of the harsh mix of an unfavorable exchange rate, very high prices, and little options in the streets of Cuban cities. Cuban citizens who receive money from relatives abroad have not gone unscathed. It is worth to point out that a significant share of the Cuban population has access to, and depends indirectly on, remittances. The purchasing power of many Cuban households has been adversely impacted by the appreciation of the CUC. At the same time, workers who are paid in ACP keep complaining and blaming the CUC for their many shortages. Everybody is unsatisfied. In sum, although performing stably, the CUC has not fulfilled the expectations after the monetary reform in 2003–2005. The resignation of Fidel Castro as head of the Cuban Government has focused worldwide attention on Cuba. The designation of Army General Raúl Castro, known as more in favor of institutionalization and of economic reform, has unleashed a wave of speculation on the economic and political future of Cuba. Since the dual monetary system has become the target of critics, the new leader could not avoid the issue in his first speech as the new head of state in Cuba in February 2008. His words did not hint any bold move regarding monetary policy. Just a few days after Raúl’s inauguration as head of state, rumors about an imminent appreciation of the Cuban peso drew many Cubans to exchange outlets. Citizens were trying to sell U.S. dollars and other foreign currencies at the best possible rate. The events of 2004 were still too fresh to be disregarded. It did not take long before the authorities made it clear no significant change was about to happen. In fact, the most recent measures have signaled the new government is implicitly protecting the use of foreign currencies in Cuba. Since February 2008, the Government has lifted several restrictions on Cuban citizens regarding the use and access to some goods and services. At the time this article was being written, some prohibitions had already been lifted. Cuban citizens can now buy electric appliances and computers in the shoppings. Cubans have now access to hotels, previously reserved for foreigners. Restrictions on the use of cellular phones by Cuban citizens were lifted. Cimex and other dollarized retailers have begun to sell tools to Cuban farmers and other Cuban workers to use in their trades. The above listed measures have a common denominator: Cubans will have to pay in CUC for all those goods and services. The ACP has no role at all in this incipient liberalization program. Time passes and, despite rhetoric and complaints, socialist Cuba continues to cling to the use of foreign currencies. In spite of the stabilization of the Cuban peso, dollarization can be categorized as an outstanding case of hysteria, as use of the foreign currency has persisted even when inflation declined and stabilized. The economic literature has provided some explanations on this interesting phenomenon, but none of them seems to fit well in the Cuban case. Latin America has unfortunately experienced some of most dramatic episodes of hyperinflation and currency crisis. However, market economies do not provide a useful benchmark to analyze the persistence of dollarization in Cuba. The roots of the Cuban dollarization lie in the very centralized nature of its economy and the unchallenged monopoly power of the Cuban Government. First of all, it is worth remembering that the dual system is an intrinsic flaw of centralized economies. The central authorities are aware of the inconvertibility of the domestic currency, which at the same time is the result of the many distortions of the price system. That is why they try to isolate operations in hard currency. They refuse to mix revenues in foreign currency together with the stream of transactions in local currency. They simply do not believe in their own currency. The former Soviet Union had its own dollarized networks, the berioshkas, a web of retail stores open to diplomats, foreign visitors, and other officials, where only hard currencies were accepted as a means of payment. Of course, the berioshkas did not play in the Soviet economy the key role the dollarized network plays in Cuba. So far, the Cuban government has avoided even minor risks in the local exchange market. The government has operated quite guardedly: they never sell U.S. dollars to the population. Buying CUC is not easy, since only a few scattered outlets are allowed to sell CUC. Monetary unification would drive the Cuban government out of the hedged position it has maintained regarding currencies. Cubalse, Cimex and Gaviota’s stores—which feed the budget of the military and the political apparatus—would have to sell imported products in Cuban pesos. Moreover, Meliá Cohiba restaurants and cafeterias would have to honor Cuban pesos. In sum, it is hard to conceive a scenario without dollarization under the current political system. Unless the Cuban economy experiences a gigantic economic boom—genuinely founded on local economic forces and not on external subsidies—the Cuban Government will not trust its own currency and dollarization will continue. The Cuban monetary system of the future should be devised in two stages. The first stage should address the best choice within the current political framework. A second stage should select the best choice available to a new government once a political transition is in motion. Earlier in this paper we have presented the reasons why the Cuban government cannot get rid of foreign currencies. The question remaining is what the Cuban government means when it promises that there will be monetary convergence. Let us look in the dictionary of the Cuban leadership in order to understand what monetary convergence means to them. To the leadership, monetary convergence means a return to the 1980s. That is, return to a discriminatory system, where the population has access to a retail network distributing low-quality products, most of them coming from China—such as the well-known Panda TVs and refrigerators—plus locally produced food and beverage products. A small, upscale network of stores operating in hard currency would be available to meet the demands of diplomats, tourists, and some privileged officials. The counter-reform started in 2003 had been paving the way for the above scenario. Upscale appliances had been withdrawn or sold at stratospheric prices. New resorts, where foreign currencies are accepted, locked most tourists away from common citizens. Draconian measures and prohibitions on the private rent of houses to foreigners dwindled links and contacts between Cubans and foreigners. A sort of monopoly power exercised by the government over the dollarized retail network made this practice easier. Many in Cuba are now missing the days of 1995–2000, when foreigners mixed with Cubans in Havana streets as well as in streets in other cities. Nonetheless, the recent liberalizing measures are not compatible with the scenario above described. On the contrary, as people are given more access to good and services in CUC, a comeback to the discrimination of the 1980s looks further away. No matter the many complaints about the monetary maze in Cuba, there is a strong reason that prevents the Cuban government from acting against foreign currencies: Cuban citizens are not really complaining about the monetary dualism, but about the many shortages affecting them. Receiving a monthly salary of $10 dollars will not satisfy anybody. Having the right to buy dollars in every corner at 25 ACP per dollar, while earning 200 ACP a month, will not satisfy anyone. In sum, monetary unification by itself cannot fill the empty shelves. The official acceptance of the U.S. dollar in 1993 was welcomed by the population. Cuban economists have acknowledged that most Cubans have access to U.S. dollars.5 Even black people, with by far fewer relatives abroad compared to whites, are getting more access to U.S. dollars. Many of them work as tradesmen. Others have gained access to U.S. dollars as sportsmen, artists, and other related jobs. Re-imposing penalties against the U.S. dollar just will satisfy an envious and frustrated minority of people. The issue has other dimensions. Rumors about the appreciation of the ACP persist. The dollar is expected to fall to 19 ACP. The appreciation is supposed to foster monetary unification. Although this scenario is possible, the current leadership has reasons to move cautiously. Appreciation of the Cuban peso will create a mirage and will signal a false economic strength of the Cuban economy. The new leadership knows the economy is as vulnerable today as in the early 1990s, when the special period began. The possibility of a sudden cut in support from Venezuela is nothing but dreadful. Measuring the vulnerability of the Cuban economy is not a complicated exercise. As a measure of vulnerability, we can use the ratio of what we can call “subsidized exports” to total exports of goods and services. Subsidized exports are those exports underpinned by special and favorable trade conditions with another country. In other words, they represent revenues from goods and services with little or no value in the world market. Regardless of the contribution and the quality of services provided by Cuban workers in Venezuela, it is hard to identify another country ready to pay for them as generously as Venezuela has done over the past five years. As depicted in Figure 2, exports of services—largely to Venezuela—represent 47% of total exports and 50% of total imports. In other words, Venezuela is subsidizing nearly half of Cuban imports. With the economy in such tottering condition, the new leadership will think twice before appreciating the ACP. The appreciation will rather depend on an economic recovery with solid foundations. An interesting question is how the Cuban government would react in the event of a sudden drop in revenues from abroad. It is hard to imagine the Cuban authorities accepting unconditionally a depreciation of the Cuban peso and exchanging 60, 80 or 100 ACP per dollar. But failure to do this will undoubtedly bring back the foreign currency black market. In such a crossroad, a mix of harsh measures targeting the black market and the support of artificial exchange rate is a likely scenario. An eventual transition government in Cuba will have to deal with the thorny issue of monetary dualism and the non convertibility of the Authentic Cuban Peso. The purpose of this section is to briefly elucidate about the best choices left to the first transition administration. I support the idea that a transition government will have just a few degrees of freedom to implement a radical monetary reform during transition. The future course of monetary policy in Cuba will be determined by the starting point, the heritage from the current political system. The new government will have to weight the pros and cons of any possible monetary choice into a broader socioeconomic and political model. It will be kind a cost-benefit approach. A political transition in the midst of another plunge of the economy will likely shoot dead the Cuban peso. If the Cuban peso goes through a sharp depreciation, like the one it underwent in the early 90s, it will become a useless piece of paper, repudiated by the entire population. In this scenario, the U.S. dollar and other foreign currencies will overwhelm the Cuban peso. An immediate adoption of the U.S. dollar cannot be taken for granted. However, a democratic government—or a least a true transition government—cannot embark in a policy of repression against the use of foreign currencies. In sum, the cost of saving the peso will entail more costs than a democratic government can bear. There is the possibility of creating a stabilization fund to support the Cuban peso. The first question is whether foreign governments and institutions will put this issue in the priority list to support Cuban transition. The second question is if saving the national currency will be a top priority for a heavily burdened transition government. However, there is no reason to maintain the CUC, which has added more distortions to the economy. Whether the island moves toward full dollarization or towards monetary independence, the CUC should leave the stage. After 15 years of lifting the ban on the use of U.S. dollars, Cuba remain stuck to using foreign currencies, and no matter the stabilization of both the CUC and the authentic Cuban peso, the multi currency system is still standing. The new leadership has not hinted any radical reform to restore a single currency in the island. Moreover, the latest measures are somehow signaling foreign currencies will keep playing an important role in Cuba. The current government is fully aware of the very fragile situation of the economy and the extreme dependence on Venezuela. In this scenario, further artificial appreciation of the Cuban peso does not seem an appropriate action. The first transition government will inherit very little degree of freedom to restore the authentic Cuban peso as the only currency. An administration committed to a democratic transition cannot take radical actions against foreign currencies. Any possible course of monetary policy will have to accept the multi-currency monetary system as a reality. The time for monetary independence in Cuba is still far away. 1. Economic Commission for Latin America and the Caribbean, 2000, La Economía Cubana: Reformas Estructurales y Desempeño en los Noventa, Fondo de Cultura Económica, México. 2. Vidal, Pavel, 2006, Estabilidad, Desdolarización y Política Monetaria en Cuba. Centro de Estudios de la Economía Cubana. 3. It is noteworthy that Granma, the official newspaper of the Cuban Communist Party, cheers every new record high world market oil price. 4. Speech by Army General Raúl Castro at the constitutive session of the VII Legislature of the National Assembly of People’s Power. Granma, February 25, 2008. 5. Doimeadios, Yaima and Hidalgo de los Santos, Vilma, 2003, Dualidad Monetaria en Cuba: Causas e Implicaciones de Política Económica, Universidad de la Habana, Escuela de Economía. 6. Cuban economists in the island have dismissed a corner solution to promote monetary convergence in Cuba. See Doimeadios, Yaima and Hidalgo de los Santos, Vilma, 2000, “Equilibrios Monetarios y Política Económica,” Economía y Desarrollo, Vol 127, No 2.